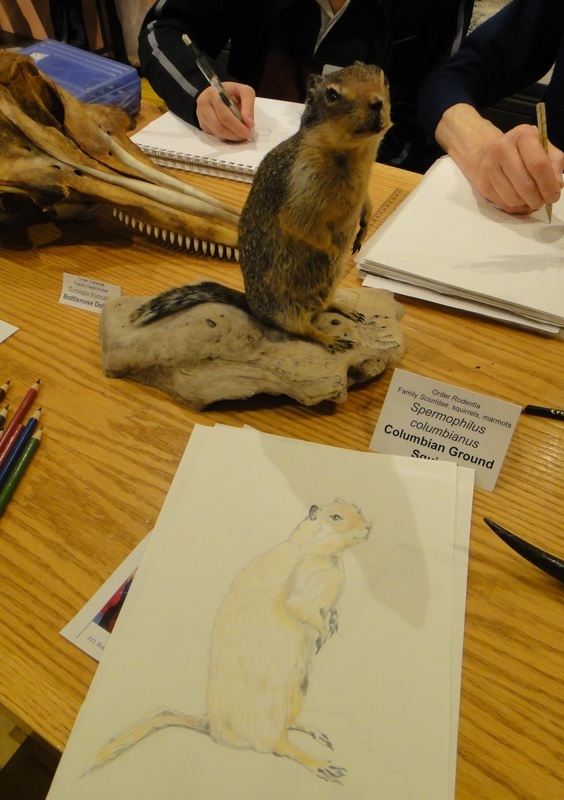 ​​Dozens of families joined the Guild of Natural Science Illustrators Northwest - Elizabeth, Jessica, Barbara, Krister, Jeanne, Cyndi, and me for studious time from the museum's hustle and bustle for drawing studies of mammals. 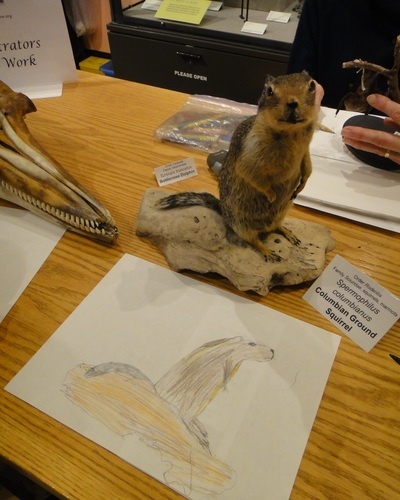 Among the cool Burke specimens, the Columbian ground squirrel was a favorite with all! Enjoy all of the drawings! "Dual Natures: Illuminating the Illustrator's Mind"
Scientific illustrators Liz Clayton Fuller, Barbara Ierulli, and myself presented our path to scientific illustration to an audience of students and faculties in arts and sciences as well as members of the community. 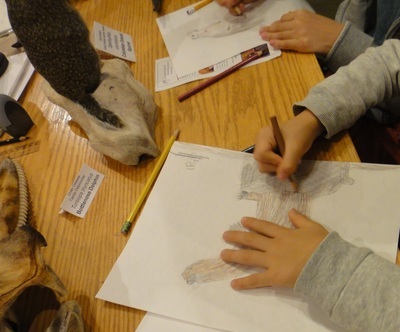 The audience was then invited to play the drawing game of "Exquisite Corpse" using collection specimen from the Slater Museum of Natural History. Teaching juniors and seniors skills and techniques to represent plants accurately. Practicing drawing and inking techniques while making detailed observations to become intimate with the characteristics of medicinal plants. 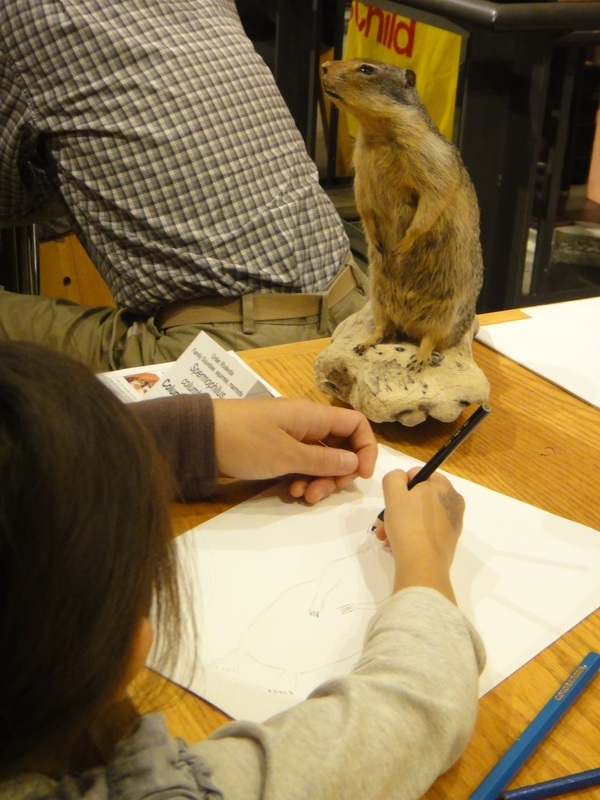 Nothing better than discussing scientific illustration and sketching on a rainy, fall day in Seattle! ​Illustrators Rachael, Krister, and Jeanne from the Guild of Natural Science Illustrators NW enjoyed drawing the curious specimen that we has access to for Birds at the Burke. 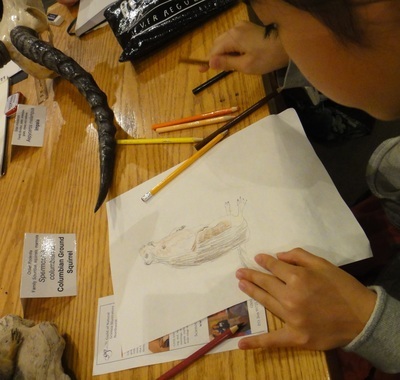 Exploring working at the intersection between Sciences and Art with 9th to 12th graders. ​And sketching with these talented students! 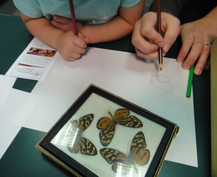 ​So many joined Jessica, Alyssa, and me in drawing beautiful insects all day. 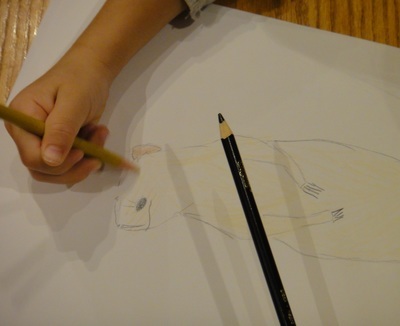 It is amazing to see children and their families draw alongside scientific illustrators. SCIENTIFIC ILLUSTRATOR - Low tide beach walk at Lincoln Beach, Seattle. 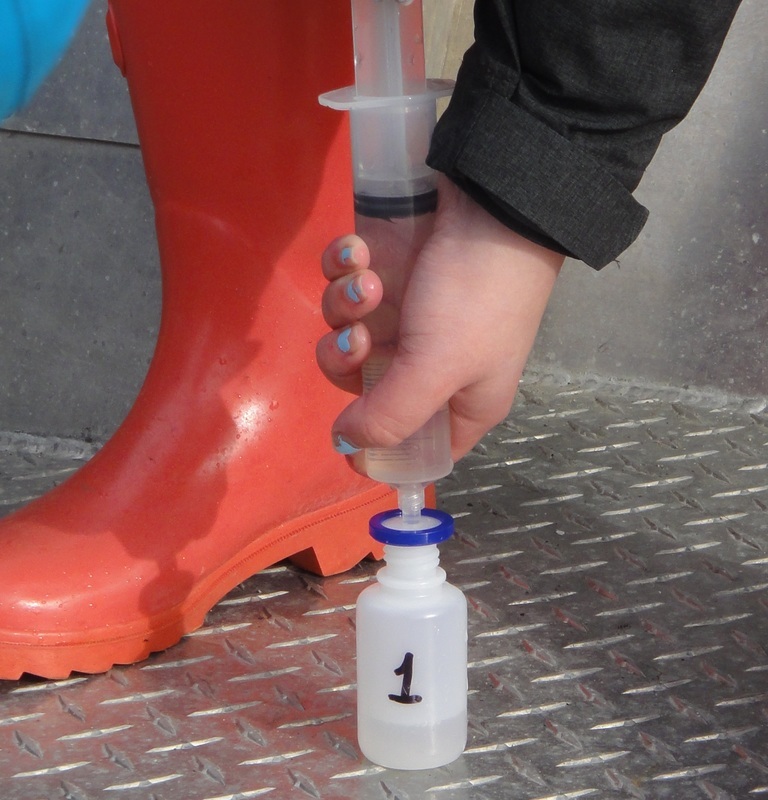 ​Thank you Jessica for organizing the low tide beach walk for GNSI-NW members. 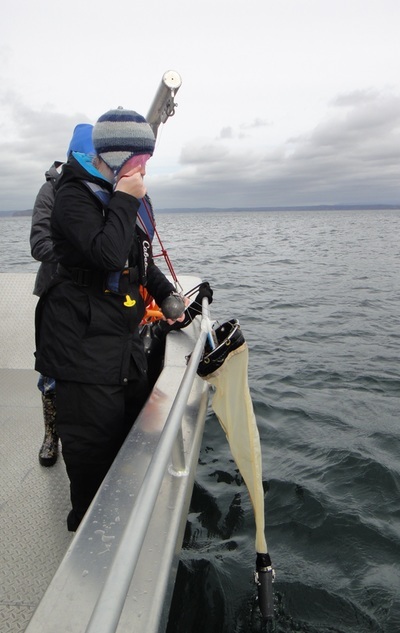 And special thanks to Bill and Julia - Seattle Aquarium Beach Naturalists - for sharing your knowledge of and enthusiasm for the marine ecology of the Salish Sea with all of us. 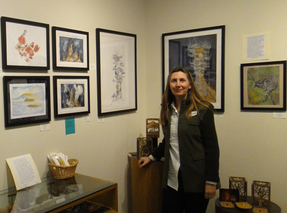 FIELD EXPEDITION ARTIST - Check out the article in the New York Times travel section to see my field sketch! ​Thank you Janie Osborn, photographer extraordinaire! A photo of one of my watercolor, field sketches of Grand Canyon (Summer 2015 expedition) is selected to illustrate the article "Rafting through the Grand Canyon in Vintage Style" by Daniel Jones. 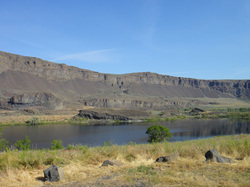 GEOLOGIST - Exploration of the Geology of Washington State - Five days field trip. Twenty eight, 6th grade, bilingual students studied geology in the field on a 900 miles trek around our state. For more, check out the 2016 Education Activities. ​Thank you Cécile (Sciences), Cécile (French), Emeric (Geography) and Gilles (Technologie) for your enthusiasm, knowledge and sense of humor during this superb experience with your students! 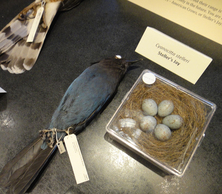 "Natures' Call: Natural History of the West"
Monday through Friday, 11 am to 5 pm and Saturday 11 am to 4 pm. Exhibition hours: Monday through Friday, 9 am to 4 pm and Sunday 9 am to 1 pm, and by appointment. 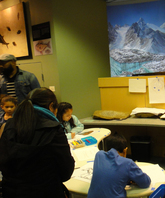 Hundreds of families and young children came to draw and trace dinosaurs at the "Illustrators at Work" at the museum. ​Thank you Barbara and Rachael for your help making this day one of the most successful Burke Days of the year! A fabulous day of seagoing work with the students of ORCA Cohort 12 that I met earlier in February. Today, despite the windy weather, the students navigated the research vessel Phocoena, making observations of marine and land organisms, and collecting data in the waters off the coast of Everett. On these "State of Possession Sound" research cruises, that are part of their learning at ORCA, the students monitor dissolved oxygen, temperature, salinity, and pH in the water column. They also collect plankton and sediment samples in Puget Sound. 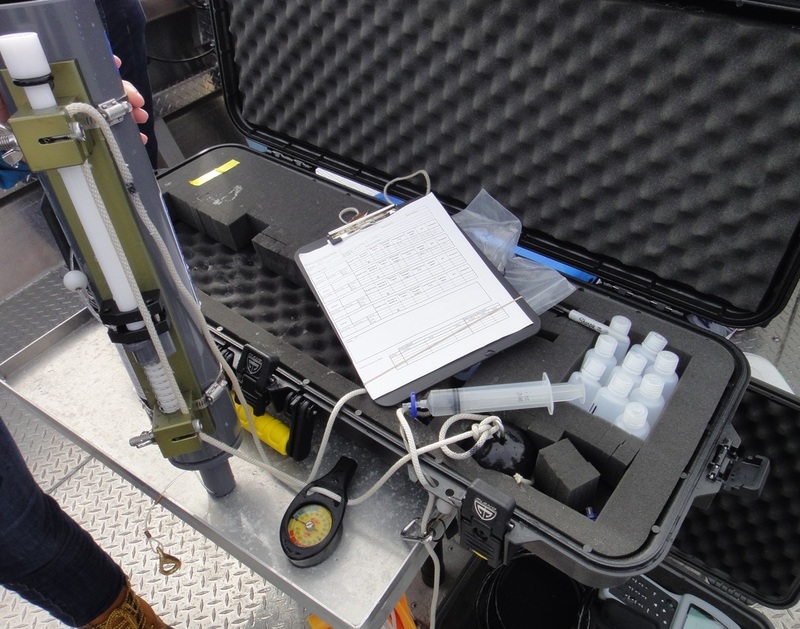 The data collected will inform their research question and help them refine their research approach as well as help monitor the environment of the Salish Sea. Next year they will present their research results at local and regional conferences. 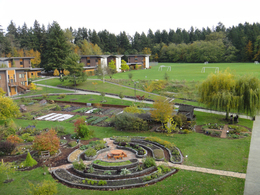 On Friday May 20, ORCA Cohort 11 will present their results at the Undergraduate Research Symposium on the campus of the University of Washington. 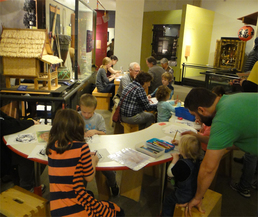 Thank you to all the families that came to the "Illustrators at Work" table to draw and learn about regional artifacts. 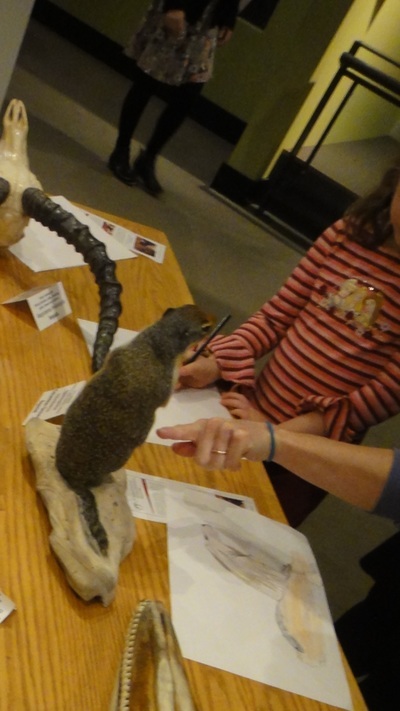 Katherine, Cyndi, Rachael, and I enjoyed discussing scientific illustration with you and hearing about your personal experiences with drawing. What a luxury to spend time in the alpine landscapes of the North Cascades for a creative residency! Lake views from my temporary studio, nature walks on snowy trails, discussions with center staff and graduate students, cozy library, all aspects that contributed to an inspirational time while discovering this mountain environment during its dormant stage. Focusing on a daily basis on sketching, drawing, and planning new projects was an invigorating way to start the year. Even gloomy, rainy days, provided opportunities to be creative! ​ Read more... on January 29 2016 blog.